Clark has signaled he won't sign the non-exclusive franchise tag nor attend training camp with the Seahawks this summer, Ian Rapoport of NFL Network reports. The Seahawks placed the non-exclusive franchise tag on Clark on Monday, John Boyle of the team's official site reports. 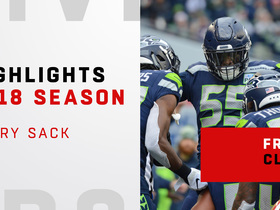 Analysis: A second-round pick by Seattle in 2015, Clark has proved his worth and then some, totaling the ninth-most sacks (32) in the NFL the last three years while missing just one game during that stretch. 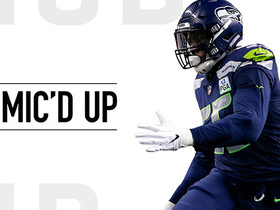 The tag ensures he'll be a Seahawk in 2019, with a price tag of $17.128 million unless the two sides reach an agreement on a multi-year contract by July 15. Clark is viewed as the "primary candidate" for the Seahawks' franchise tag during the offseason, Gregg Bell of The Tacoma News Tribune reports. 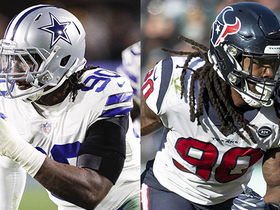 Analysis: Expect a decision either way to come soon since the two-week window for teams to designate franchise- and transition-tag players opened Tuesday. The pass rusher would be a valuable commodity if allowed to hit the open market after Clark finished sixth in the league with 14 sacks in 2018. That production is particularly impressive when considering Clark saw significantly fewer snaps than most of the players above him on the leaderboard. Clark made two sacks in Sunday's win over the Cardinals. He also forced and recovered a fumble. Analysis: Clark is underrated as a pass rusher, ranking sixth in the league with 14 sacks in 16 regular-season games. He also forced four fumbles, which ties him with Aaron Donald and Von Miller for sixth place as well. Clark carved his way into stardom this season, and the Seahawks likely will reward him with a massive contract before free agency in March. Clark had five solo tackles and a sack in Sunday's 26-23 loss to the 49ers. Analysis: Clark now has a sack in each of the last two games while the five tackles set a new season high. The 25-year-old has 12 sacks, three forced fumbles and an interception through 14 games in 2018. Clark made four tackles and a sack in Monday's win over the Vikings. Analysis: Clark put constant pressure on Vikings quarterback Kirk Cousins and was able to record his career-high 11th sack of the season. The fourth-year pro chose the right season to peak as he's due for a new contract in March. A Week 15 matchup against the 49ers will be tough to pad the stats, as quarterback Nick Mullens has been sacked just twice per game. Clark recorded four tackles -- including one for a loss -- and two sacks in Thursday's 27-24 win over the Packers. Analysis: Clark now has 10 sacks through 10 games, tying the mark he set in 2016 through 15 contests. He now ranks third in the league behind only Aaron Donald (12.5) and Danielle Hunter (11.5). Clark recorded a sack in Sunday's 25-17 loss to the Chargers. Analysis: Clark's been a pass-rushing menace with 7.5 sacks in eight games, and it appears he'll easily surpass his career high of 10 from two years ago. His IDP value relies on dropping the quarterback, however, since he's posted more than two tackles in just two games this year. Clark recorded two tackles (one solo), including a sack, and recovered a fumble in Sunday's win over Detroit. Analysis: Clark now has 6.5 sacks on the season, putting him well on his way to a career year if he can maintain the current pace. Looking ahead to next week, Clark and the Seahawks play host to the Chargers. 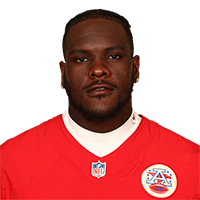 Clark left Sunday's game against the Raiders early in the third quarter with an illness, Gregg Bell of the News Tribune reports. Clark made two solo tackles -- one for a loss -- and one interception in Sunday's 33-31 loss to the Rams. Analysis: It was Clark's first career pick, and it helped replace some IDP value that was lost when he failed to record a sack for the second straight week. Clark continues to be the team's top pass rusher, but his value suffers from averaging just two tackles per game. Clark (illness) is questionable for Sunday's game against the Rams, Brady Henderson of ESPN.com reports. 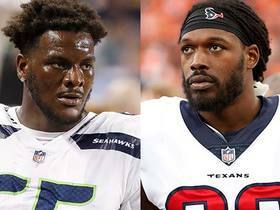 Analysis: Clark is currently batting food poisoning, but head coach Pete Carroll seemed confident Friday that the defensive end would be good to go by Sunday. Expect Clark to be a true game-time decision this weekend. 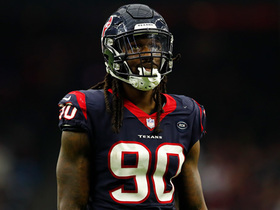 Clark recorded two tackles (both solo), including a sack, in Sunday's win over Dallas. Analysis: Clark has recorded a sack in each of Seattle's first three games. He hasn't generated great tackle numbers, but he's a quality IDP so long as he can continue getting to the quarterback. 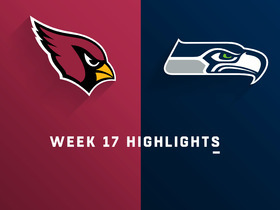 He and the Seahawks head to Arizona to take on the Cardinals in Week 4. Clark recorded three solo tackles and a sack during Monday's 24-17 loss to the Bears. Analysis: Though Clark's tackle numbers aren't eye-opening thus far, he's been able to get to the quarterback in both of Seattle's first two games, adding to his career sack totals. The 25-year-old posted nine sacks in 2017 and is well on his way to surpassing that number this year. Clark (elbow) was a full participant in Thursday's practice, Gregg Bell of The Tacoma News Tribune reports. Analysis: Clark played through an elbow injury during Seattle's season-opening loss to the Broncos, a game in which he logged one sack. He now appears fully recovered. Consequently, expect the fourth-year pro to suit up against the Bears on Monday night. Clark dealt with an elbow injury during Sunday's game against the Broncos, Bob Condotta of The Seattle Times reports. Analysis: Clark still logged 43 defensive snaps, which is on pace with the 46 per game he averaged in the previous two seasons. Coach Pete Carroll didn't seem too concerned about Clark's availability for Monday's game against the Bears, but pay attention to whether his name is on the injury report when it's first released Thursday. Clark made one sack during Sunday's 27-24 loss to the Broncos. Analysis: Clark was the only Seahawk to get to Broncos quarterback Case Keenum. The fourth-year pro has totaled 19 sacks over the last two seasons and appears to be keeping his hot hand rolling in 2018. Clark (elbow) was absent from Wednesday's injury report, John Boyle of the Seahawks' official site reports. Analysis: Clark was held out of Monday's practice after hyperextending his elbow, but it seems that was more of a precautionary decision than anything else. Without Clark's name on the injury report, there's good reason to believe the Michigan product will be ready to start Week 1. Clark missed Monday's practice due to a hyperextended elbow, Curtis Crabtree of Sports Radio 950 KJR Seattle reports. Analysis: Seattle didn't elaborate much on Clark's status. Hyperextended elbow injuries don't necessarily carry a prolonged recovery period, so it wouldn't be surprising to see Clark back at practice in the coming days. Either way, this will be something to monitor as Week 1 approaches. Clark (wrist) practiced at full speed Sunday, Gregg Bell of The Tacoma News Tribune reports. Analysis: It was a quick recovery for Clark, who had wrist surgery in June, and his snap count for Saturday's game against the Chargers will be even more telling. Clark will log a hefty workload this campaign now that Michael Bennett is in Philly and Cliff Avril (neck) is retired. The fourth-year pro racked up 19 sacks over the last two seasons. Clark was limited due to a hand injury during Thursday's practice, Bob Condotta of The Seattle Times reports. Analysis: Clark had surgery on his hand and the Seahawks intend to limit him for the first week or two of training camp to allow him to recover. Clark didn't miss any games last season and is expected to be a full go when Week 1 rolls around. 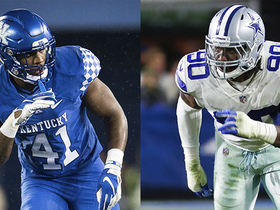 Look for Rasheem Green and Branden Jackson to get some extra reps with the first-team defense when Clark sits out. Clark (hamstring) was limited during Tuesday's mandatory minicamp, Bob Condotta of The Seattle Times reports. Analysis: Clark nursed wrist, hamstring, thigh and toe injuries during the 2017 campaign, but he didn't miss a game and posted the highest snap count (742) of his career. Therefore, worries about Clark's health aren't necessary at the time. With Cliff Avril and Michael Bennett no longer on the roster, however, Clark will be leaned on to carry another heavy workload. The 2015 second-round pick shows no signs of slowing down, though, having posted 19 sacks and four forced fumbles over the past two seasons. Clark had 32 tackles (19 solo), nine sacks and two forced fumbles in 16 games for the Seahawks in 2017. Analysis: Clark logged 12 starts and saw an increased role once Cliff Avril (neck) was lost for the season in Week 4. The 24-year-old should see a similar role for the Seahawks in 2018 as he enters the final year of his rookie contract. Clark had four tackles (two solo) and a sack in Sunday's win over the Cowboys. 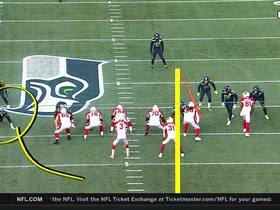 Analysis: The sack is Clark's ninth of the season, which leads the Seahawks. The 24-year-old played a typical 48 of 74 defensive snaps Sunday, and the four combined tackles tied his game-high for the season. Clark (toe) is listed as active for Sunday's game against the Cowboys. Analysis: Clark was a late addition to the injury report Friday after sustaining some sort of toe injury. However, he's since been cleared to play and will now take aim at a stout Cowboys offensive line that should have a healthy Tyron Smith (knee/back). Clark is listed as questionable for Sunday's game against the Cowboys with a toe injury, John Boyle of the Seahawks' official site reports. Analysis: Clark was a new addition to the injury report Friday as a limited participant, clouding his potential availability for Sunday's game. The 24-year-old leads the Seahawks with eight sacks this season, and Marcus Smith and Branden Jackson would likely be pressed into larger roles if Clark is unable to play Week 16. Clark picked up his eighth sack of the season the Seahawks' 42-7 loss to the Rams in Week 15. Analysis: Clark made his only tackle of the game count by sacking opposing quarterback Jared Goff causing him to fumble just before half time. However, the Rams recovered the fumble and scored on the next play. The 24-year-old defensive end saw 45 snaps (63.0 percent) in the contest. Clark had two tackles (one solo) and a half sack against the 49ers on Sunday. Analysis: These was Clark's first stat line in three games, even though he's played at least 30 defensive snaps in each matchup. The third-year pro has 20 tackles (11 solo) and five sacks through 11 games, and his inconsistency keeps him from being a viable IDP threat. Clark (thigh) was a full participant in practice Thursday, John Boyle of the Seahawks.com reports. Analysis: Clark was one of several Seahawks to go down in last Thursday's win over the Cardinals, but after getting some much-needed extra time off, the defensive end appears to be ready for Monday's tilt against the Falcons. Should the team decided to monitor his reps due to the thigh injury, expect Dwight Freeney to see a few extra defensive snaps. Clark suffered a thigh injury and is questionable to return to Thursday's game against the Cardinals, Gregg Bell of The News Tribune reports. Analysis: Clark ran into teammate Sheldon Richardson late in the fourth quarter, leaving both players down on the field. Look for more updates to come once the game concludes. 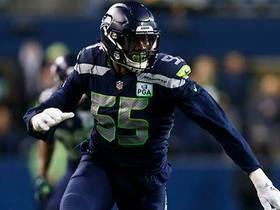 In the meantime, look for Dwight Freeney to possibly see expanded reps.
Seattle Seahawks defensive end Frank Clark is mic'd up against the Arizona Cardinals in Week 17 of the 2018 NFL season. 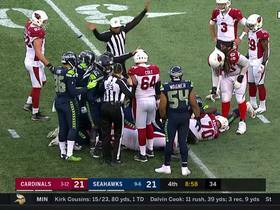 Seattle Seahawks rookie defensive end Jacob Martin forces the fumble on Arizona Cardinals quarterback Josh Rosen for a 7-yard loss, and Seahawks defensive end Frank Clark is there for the recovery.